Organization-wide experiments can often be tougher to launch than learn from or reorient around. Once staff is brought on and workflows established, changing anything may be more challenging than ever launching the project to start. That’s when bold leadership is most needed. That’s been on my mind recently when I’ve thought about the wonderful progress that has come with NewsWorks.org, the online news home for WHYY, the Philadelphia region’s public media outfit. Let’s look at its three-year history and its future and use it as an example for being bold enough to experiment and then knowing when to act on that experiment. 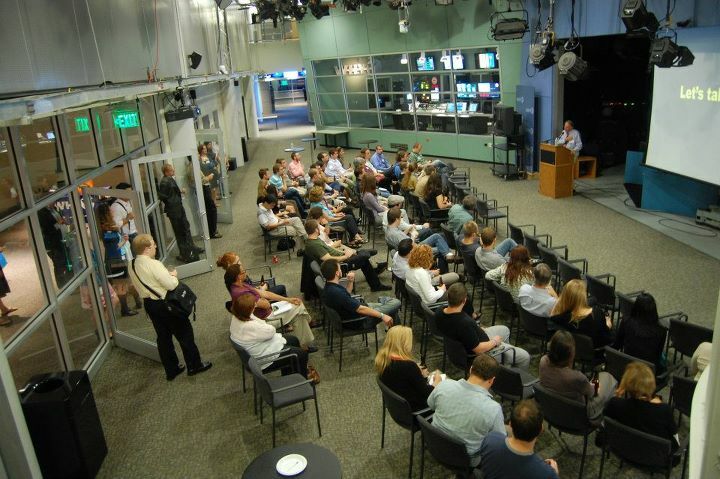 Nearly a year after launching, the team behind the NewsWorks community-driven online news effort from WHYY, the Philadelphia public media organization, shared its lessons. It was the third event from a revived local chapter of the Online News Association. After an hour of beer donated by Boxcar Brewing, sandwiches from the Trolleycar Diner and pretzels from the Center City Soft Pretzel Co., I kicked off the night and introduced WHYY editorial chief Chris Satullo. Satullo and Don Henry, two of the many leading faces behind the NewsWorks initiative, shared five tasks they got right and five tasks they got wrong. Text of them all and video of the first few below. Do news organizations have responsibility for their outcome? Overall I felt this BCNI, with some 150 attendees from startup shops and some serious brands, featured more sessions that embodied that unconference spirit in being less presentation and more dialogue, something I don’t think I felt in the past. I was also interested to see the true step forward past social media and other tools and into sustainability, which I find to be a far more important place to be. The annual national Online News Association conference, to be held this fall in Boston, has launched its 2011 panel picker, in which those interested can vote to support their favorites of a couple hundred suggested sessions. Data Sets You Free — Informed by my Transparencity work, I proposed to lead a session with Robert Cheetham of Azavea and Chris Satullo of WHYY that would focus on the following: “In Philadelphia, a GIS shop, an NPR affiliate, a foundation, an indie news site and a technology community are coming together to organize, catalog, share and use city government data to create applications, stories and coverage that boosts transparency and efficiency. This presentation focuses on what was done, why collaboration was important and lessons on doing the same elsewhere.” Questions: 1. Why is government data so important? 2. What are challenges, obstacles and lessons from an actual example? 3. What can other journalists learn from such a project? The William Penn Foundation board of directors has pledged a three-year $2.4 million grant to Temple University to incubate “a new organization designed to strengthen our region’s capacity for professionally-produced public interest journalism,” as described by strategic consultant Michael Greenle. “This will fund journalism, support other outlets and find and cover gaps in coverage,” said Greenle in a small meeting of stakeholders yesterday. It may likely take at least a year for real momentum to happen here. Various matching grant efforts are expected to boost that overall total, in addition to future revenue plans, Greenle said. ‘One Stop Shopping’ — Centralized resources from Temple that could benefit public affairs journalism in the region (like MPIP, the computer science program, the journalism program) to be offered to partners in some way. Incubate Collaboration — This center will incubate a collaborative effort that will take a more active role in public affairs journalism that could very well look like this or portions of this. Or not. That’s to be left up to senior staff, as explained below. Host Events — Create a broader dialogue among journalists by housing the existing Phiji series and, as I thought, perhaps involving the BarCamp NewsInnovation event we and Technically Philly have put hosted at Temple. The foundation’s interest in this space was first addressed publicly here after a stakeholders meeting last January. Greenle’s recommendations and work with the foundation follows previous research from the JLab institute announced in April. This project is influenced by proposals set forth by my colleagues and me at Technically Philly. A lot of legacies over at WHYY are going to be forged with whatever comes out of Newsworks, the online news re-branding and redevelopment initiative from Philadelphia’s NPR affiliate that I first wrote about back in April. In short, NewsWorks, which had its official launch last Monday, Nov. 15, is WHYY’s new online news brand, serving as home to its existing journalism, in addition to (A) new columns, (B) calls for community contributions and (C) a trial hyperlocal push in northwest Philadelphia. It’s a big bold swing and at least four years in the making. Eighteen months ago, I was searching for the best metro columnist in Philadelphia. I felt the Inquirer’s Dan Rubin was the nearest in a legacy of citywide voice boxes, telling the broadest and widest ranging stories. Perhaps that’s true. But it’s been nagging me that outside of some media-focused friends — and even then — I never hear Rubin or his other traditional columnist colleagues with any sort of regularity. Instead, the columnists whose names I read, hear mentioned and myself reference the most are increasingly niche orientated. They’re not writing about the city, they’re writing about and for a very narrowly focused part of it. These are other critics and writers who have long existed in newspaper parlance, but I believe the increasingly niche-dominated media ecosystem means their voices carry greater power than before. WHYY, the public media station for the Delaware Valley region, is hoping a $1.2 million hyperlocal news initiative for the northwest region of Philadelphia will be the first successful bold Web-first journalism effort from a legacy media player. Updated: That northwest hyperlocal is just one very large, very expensive trial vertical within a larger rollout. But will “NewsWorks” go the way of a handful of its predecessors?